1330 Lukie Points will be rewarded to you when you buy this. 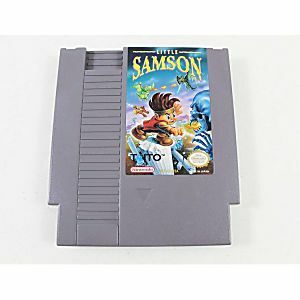 Little Samson - one of the RAREST original NES Nintendo Games out there! Cleaned Tested and Guaranteed to Work! You're Little Samson, a brave young mountaineer, and you're about to embark on the most important journey of your life. The Imperial Forgy has been attacked by Ta-Keed, the Prince of Darkness, and you're the only one who can stop him. Along with the owners of the Magic Bells, you'll venture through a vast world filled with evil creatures and dangerous beasts. But you have the ability to turn into several different forms: Kikira the Dragon Lord, Gamm the Rock Lord, and K.O. the mouse. Take advantage of the special powers each form possesses, and you should have no problems saving Imperial Forgy and defeating Ta-Keed. You'll also be able to collect power-ups that are scattered throughout the world, which will make you even more powerful. Everyone is counting on you, Little Samson, so gather up your courage and get ready. 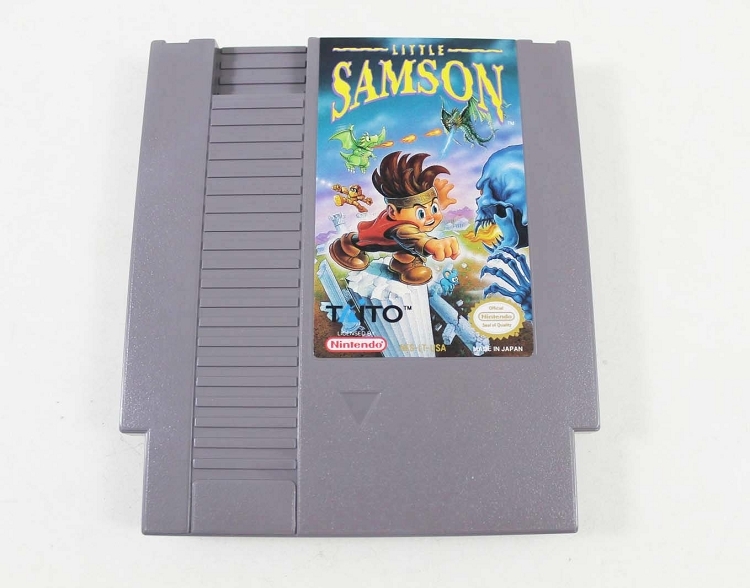 Little Samson is one of those games that slip through the cracks way back in 1992 when the 8bit Nes era was on it's way out.I bought a copy of this game the same time a bought my copy of Nintendo World Championships 1990 .Than I ended up selling it (luckly I kept my NWC cart),I than bought other copy of Little Samson but I sold it as well.I regret it to this very day.Little Samson has been called a Mega Man "clone" by several other retro video game reviewers and to certain extant that's true.But this game has superior graphics when compared to the original Mega Man games and the sound is pretty good for an 8bit game.In the end this game is an obscure game that was never given a chance when it was released back 1992 and it deserves a sporting chance.With a $600+ pricetag their's very few retro game players/collecter that can afford or even justify paying that kind of doe for this very game.So if you have the extra money to spare I recommend snagging a copy .All other people who can't justify dropping the loot for an original copy ,you really should play this classic on an emulater.